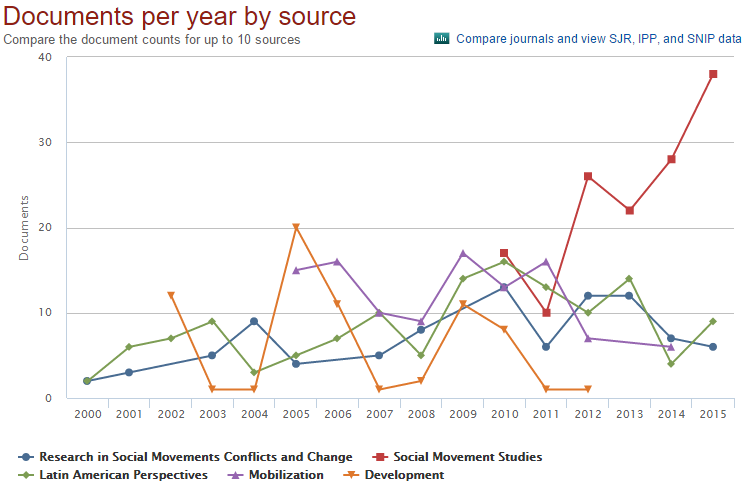 Having recently discovered that Scopus offers some useful tools for analysing large sets of search results, I decided to try to use them to get an overview of social movement scholarship over the last four decades. This is something of a ‘quick and dirty’ analysis, but what it seems to show is that while there are a few obvious central outlets for research on social movements, there is a very long tail of journals publishing occasional work on movements. More interestingly, it may also be the case that while there are a fairly stable set of themes and theories utilised in core movements journals, these are very narrow compared to the concepts used in the wider set of publications discussing social movements in general. Firstly, it is worth noting that the sheer quantity of publications with ‘social movement(s)’ in the title, abstract or keywords has seen a remarkable rise. Of 21,807 such publications (articles in social science/humanities publications only), 70% were published since 2006, with a further 21% published in the previous decade. At first glance that might signal a massive increase of interest in the field, however it is also likely a reflection of both the general increase in academic publishing and (possibly) more extensive inclusion in Scopus’ index in more recent years. 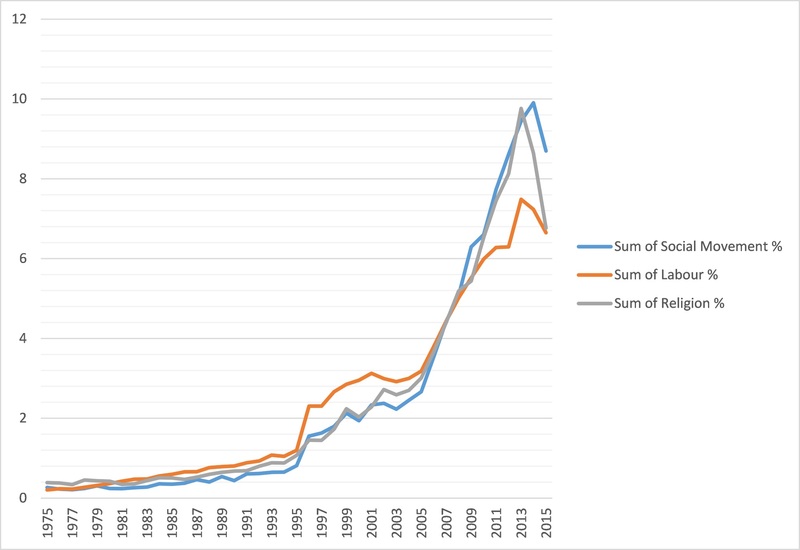 Indeed, a rough comparison with two other sociology search terms – labour/labor and religion – shows a similar distribution of publications (Figure 1 – click image to enlarge). So, who’s publishing all this stuff? The charts below relate to articles published this century, accounting for over 18,000 publications, or 84% of social movements articles since 1975. 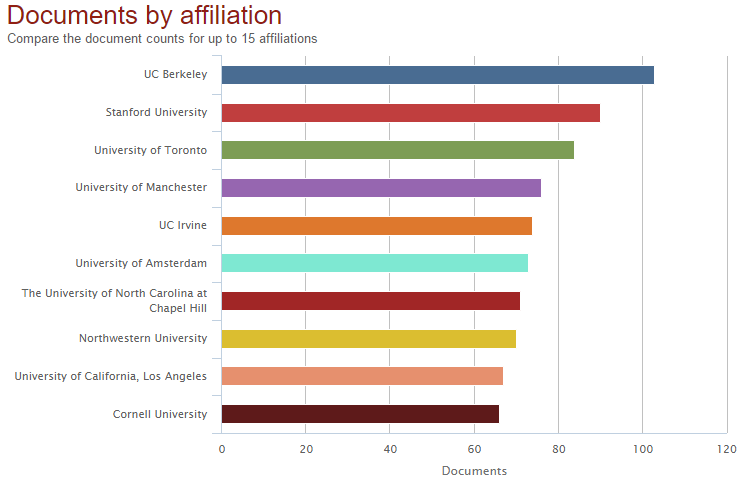 Figure 2 presents common author affiliations in the dataset. It is nice to see University of Manchester in fourth place there – and a good chart to show the boss! The absolute numbers are low though, so there is a very very long tail of institutions producing small numbers of social movement publications. Figure 3 shows the 5 most common publications in which these articles appear. Unsurprisingly, three key specialist publications are shown: Social Movement Studies, Mobilization and the book series Research in Social Movements, Conflicts and Change. Latin American Perspectives surprised me here. SMS began publishing in 2002, but is only indexed in Scopus from 2010. It moved to 6 issues per year from 2015 but the chart clearly shows it was already increasing its publication numbers. Again, the absolute numbers in this chart are small and there is a very long tail of publications with occasional contributions on social movements. Specialist journals don’t attract the quantity of citations of the big generalist journals, of course. Out of the 50 highest cited papers published since 1975 only four journals appear more than once: Annual Review of Sociology (9 papers), American Journal of Sociology (7), American Sociological Review (4) and Organization Science (2). The spread of journals shows a reasonable degree of interdisciplinarity, despite the dominance of sociology journals. Politics, geography and management are well represented, and individual papers from psychology and anthropology journals also make the top 50 list. Want to see the list? Of course you do: follow this link. This is admittedly very rough and ready, and one would really need to construct a specific dictionary of phrases and synonyms to do this justice. There are some highlights worth drawing out, however. 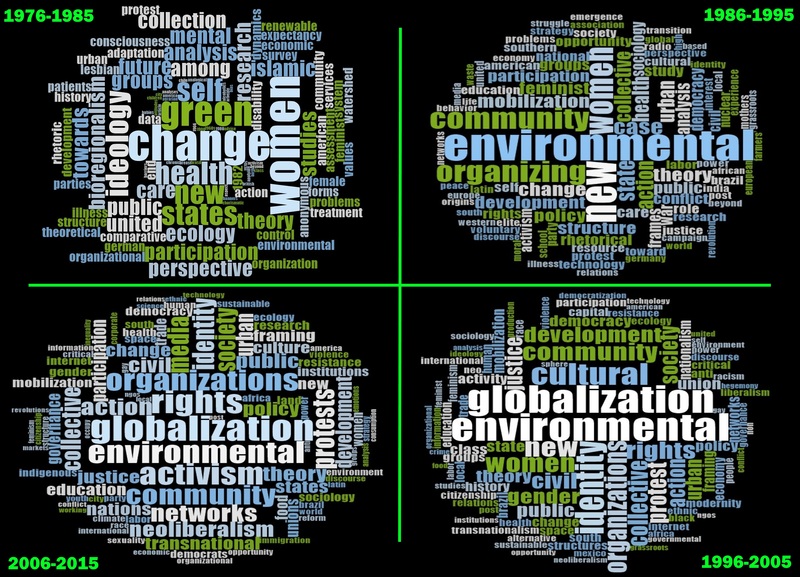 Scanning clockwise from the top-left, you can see the growing importance of environmentalism and globalization, and eventually neoliberalism and rights alongside a relative decline of work on women’s movements. In terms of analytical concepts we have ideology visible in the top-left quadrant and almost completely disappearing from view thereafter, while the ‘new’ in the top-right quadrant most likely arises from work on new social movements. Subsequently we get an increasing presence of terms such as ‘identity’, ‘culture’, ‘organisation’ and to a lesser extent ‘mobilization’. I found it slightly surprising that the latter term doesn’t appear more often in the keywords list and on this view ‘resources’ is somehow missing. More detailed analysis would be required, but that could reflect that approaches that are dominant within the most central and specialist movement publications hold less traction outside, in the long-tail of movement-relevant publications that are not necessarily positioned squarely within the field. After all, the initial selection of papers mentioning ‘social movement(s)’ in title, abstract or keywords is a broad one and so the picture we are getting here does not respect the self-defined boundaries of ‘social movement scholarship’ as a distinct field. Even a quick glance at the top 50 cited articles above makes it apparent that there is much important work being done that is clearly related to social movements but not steeped in frameworks commonly found in the core journals and book series. That may be the most interesting hint from this quick analysis and a reminder to myself to practice what I endlessly preach to my students: read more widely!